Only companies with more than Rs 1,000 crore revenue in the BT500-BT's listing of the country's most valuable companies by average market capitalization from April to September-were included in the study. The 2014 edition of the Business Today Best CEO awards ceremony turned out to be a spectacle that celebrated the achievements of the captains of India Inc. The award ceremony began with Business Today Editor Prosenjit Datta explaining the methodology of selecting the winners for this year to a huge gathering of corporate leaders. Datta said that in choosing the winners, several performance parameters were taken into consideration. A total of 20 winners were awarded in 22 categories. 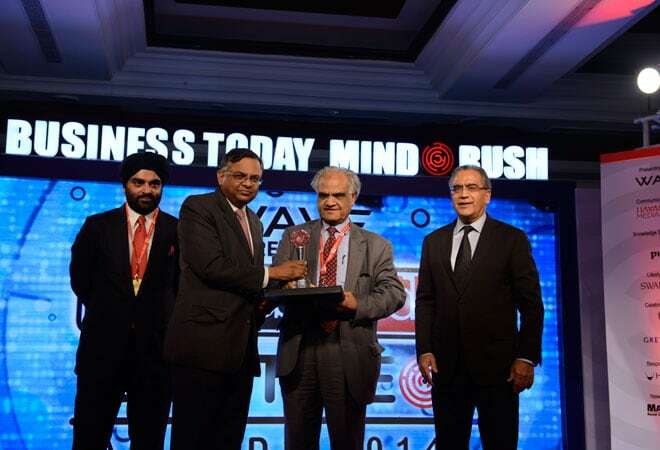 The awards were presented by India Today Group Chairman and Editor-in-Chief Aroon Purie, management guru and CEO coach Ram Charan, and Manpreet Singh Chadha, Vice Chairman at Wave Group. Anand Mahindra , Chairman and MD of Mahindra & Mahindra, was awarded two awards-Best CEO (Very Large Companies) and Best CEO (Auto & Auto Ancillaries - Large Companies). IT firm TCS' CEO N. Chandrasekaran also won two awards - Best CEO (Very Large Companies) and Best CEO (IT & ITES - Large Companies). Other prominent winners of the evening included G.V. Prasad, Co-Chairman & CEO, Dr Reddy's Laboratories, winner of Best CEO - Large Companies; Siddhartha Lal, MD & CEO, Eicher Motors, winner of Best CEO (Mid-sized Companies - Auto & Auto Ancillaries); H.M. Bangur, MD, Shree Cement, winner of Best CEO (Mid-sized Companies -Cement); and Keki Mistry, Vice Chairman & CEO, HDFC, winner of Best CEO (Large Companies - Financial Services); Harsh C. Mariwala, Chairman, Marico, winner of Best CEO (Mid-sized companies - FMCG); G.M. Rao, Founder and Chairman, GMR Group, winner of Best CEO (Mid-sized companies - Infra & Engineering); Glenn Saldanha, Chairman and MD, Glenmark Pharmaceuticals, winner of Best CEO (Mid-sized companies - Pharma and Healthcare); and Himanshu Kapania, MD, Idea Cellular, winner of Best CEO (Large Companies - Telecom).